We’d love your help. Let us know what’s wrong with this preview of Travels with Rachel by George Mahood. Knee-deep in a swamp in the depths of the Bolivian jungle, hunting for anacondas in a pair of sandals, it occurred to George that perhaps he should have booked that all-inclusive honeymoon to the Maldives after all. Join George and Rachel on their hilarious journey through the wilds of Ecuador, Peru and Bolivia, as they climb volcanoes, fish for piranhas, trek through the Knee-deep in a swamp in the depths of the Bolivian jungle, hunting for anacondas in a pair of sandals, it occurred to George that perhaps he should have booked that all-inclusive honeymoon to the Maldives after all. Join George and Rachel on their hilarious journey through the wilds of Ecuador, Peru and Bolivia, as they climb volcanoes, fish for piranhas, trek through the Amazon rainforest, take death-defying bus rides, sample some of the continent’s strangest delicacies, and try to get to Machu Picchu. To ask other readers questions about Travels with Rachel, please sign up. I'd just finished the first chapter of a Bill Bryson book and was checking Facebook from the comfort of my toil-------I mean reading chair. There was a post from George Mahood. "Oh, he's been quiet I wonder what he's been up to?" I though to myself. Well it turned out he was announcing the release of his latest book - the very book I am attempting g to review here. How damn well inconvenient of him to release a book just as I had started another! So, and I'm sorry Bill, I What? It's over already? I'd just finished the first chapter of a Bill Bryson book and was checking Facebook from the comfort of my toil-------I mean reading chair. There was a post from George Mahood. "Oh, he's been quiet I wonder what he's been up to?" I though to myself. Well it turned out he was announcing the release of his latest book - the very book I am attempting g to review here. How damn well inconvenient of him to release a book just as I had started another! So, and I'm sorry Bill, I ditched the paper back and started this one. I've read all of George's boo!s and each one has sucked me into his life like an out of control Dyson. I'm not sure what it is but I think it's the humour and the fact I seem to share that sense of humour. As a travelogue this is a brilliant book. Just enough travel detail for an armchair explorer like me and more than enough descriptive detail of the places visited to enable me to feel like I was there and save myself the hassle of visiting for myself! A short, fun and easy to read book describing George's adventures (and misadventures) with his wife Rachelle in South America. What makes the books really fun is not so much what happens, but how he responds to what happens, and his humorous descriptions of events. He has a unique ability to get himself into interesting situations (such as hunting for anaconda’s in a pair of flip flops). As in his other books, George’s typical self-deprecating humour comes through well. For fans of his other boo A short, fun and easy to read book describing George's adventures (and misadventures) with his wife Rachelle in South America. What makes the books really fun is not so much what happens, but how he responds to what happens, and his humorous descriptions of events. He has a unique ability to get himself into interesting situations (such as hunting for anaconda’s in a pair of flip flops). As in his other books, George’s typical self-deprecating humour comes through well. For fans of his other books (and you should be), this fills the gap between Josephine and Free Country. Really enjoyable. I hope you keep having adventures and writing about them. It is a pleasure to follow you along. Simply love George Mahood's books. I read a lot of travel books and for the most part, they are dire. If the blurb says "hilarious", it means they're full of very heavy handed jokes. Like his other books, which I can't recommend too highly, this one really is funny and as I read in the insomniac night, I have to suppress my laughter lest I wake my partner. Read this book and all the others, they're magic. I've read all of George Mahood's books, but now I think it's time to read them again to enjoy a chronological perspective. Well written travel experiences. As with his other books, George captures the adventures and misadventures in equally amusing measure. I'm sorry I read it so quickly and now I have to wait for the next book. In this book, George takes the reader along a backpacking journey that he and his wife took exploring Ecuador, Bolivia and Peru. As is his writing style, the book is full of humor, colorful descriptions and dialog that make you feel like you are right there with him. I would highly recommend this, and all of George’s books, to anyone who enjoys reading about life’s funny adventures presented through the eyes of an excellent storyteller! George Mahoods "Travels With Rachel: In Search of South America" newest memoir has hit my top 4 of this authors books! Loved it! Rachel and George set off for South America on their honeymoon with only a rucksack each and a limited Spanish vocabulary. It has loads of information on traveling through Bolivia, Ecuador & Peru and if I was planning a trip to the three areas this book would go into my rucksack. 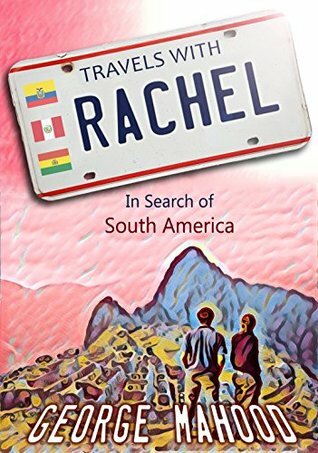 Rachel steps out of her comfort zone several times in this adventure and I have to adm George Mahoods "Travels With Rachel: In Search of South America" newest memoir has hit my top 4 of this authors books! Loved it! Rachel steps out of her comfort zone several times in this adventure and I have to admire her fortitude. George's easy writing style and witty humour keep you page turning. Bravo to George! This is a memoir I will revisit! George Mahood has a gift for humor. As always, I enjoyed this travel memoir. So far my faves are Free Country and the Josephine book. This one had several laugh out loud bits. And the travel part was so interesting. Read it! George Mahood is one of the funniest contemporary memoirists we have, and he's just getting better. In this book, he writes so clearly that I felt like I was in South America, despite never having been there. He writes brilliant imagery without you even realizing it. I also laughed out loud, winced at their more unfortunate travel moments, and found myself disappointed when it was over--I loved reading it, and didn't want it to end. My wife and I read George's books before sleep. George always provides a light note with which to end the day and occasional anecdotes to make you think. Along the way we often learn something new as George shares historical facts most of us don't know about locations along he and Rachel's journeys. They are an enjoyable couple who are well matched and obviously great friends. Once again, George Mahood managed to beautifully and humorously write about his adventures and share them with us. All of his books are indeed a pleasure to read. He writes with such sincerity also. He's passionate about his travels, and his writing. Incredible sense of humor! Another job well done! I enjoyed this book very much. Full of quirky characters, enchanting places, and crazy adventures. The author and his wife travel with eyes wide open, and a really cool attitude. I think the only thing that is better than the book, would be actually traveling with Rachel and George. I had a very enjoyable evening reading this tale. Thanks George. This travelogue of George's is funny as he and Rachel come to grips with South America. Rachel although Nervous shines through, as she boldly goes wherever George goes. Stepping on a huge Snake in a Jungle Swamp, jumping off still moving buses, and walking along perilous ridges. George never fails to entertain. Interesting and amusing journal of an early George adventure this time with his newly wed wife Rachel. Travelling in South America beats any traditional honeymoon all inclusive for an unforgettable (thankfully for us readers) lifetime experience. Entertaining well written funny read. Always a fun read. Made me realize what a fun trip I missed but also made it clear that I'm far too old to do such a trip now. I don't think I'm quite ready for the senior group bus tour but I definitely couldn't handle the backpacking. Well done, George and Rachel. Thank god George goes and does things and then writes about them so I can live vicariously through his books. He and his wife were exceptionally adventurous on this trip, and the anecdotes are cheerful, funny, and interesting. I look forward to the next book. As a traveler I found this book great fun to read. George and his wife Rachel traveled to many of the same locations I have been to in Peru. George writes with great humor and the stories kept the pages turning. I highly recommend this for any one who enjoys travel. Another enjoyable journey with George Mahood. It's a solid 3.5, somewhere between Free Country and Every Day is a Holiday. I'll continue to read his antics for fun, afternoon reads that make you long to go on such adventures yourself. I love getting to live vicariously through George. Lots of laughs as always and a few heart stopping moments along the way too. Glad to have added Travels with Rachel to my collection. Not very descriptive. More of a diary of "we did this, then we did that, we ate this, we ate that." It's nice to learn about places, and have them described. This was thread bare, so mundane and not much to it. Better reading a wiki page about the places visited. I always laugh out loud! I love the way George Mahood writes. He allows the reader to see and experience his adventures through his eyes. I read every book as soon as it is published and recommend them to friends and family. I absolutely loved this book, such a pleasure to read. As someone who loves to travel, this book helped get me in the mood for my next adventure. George Mahood's books are always an entertaining read for me. This one chronicles his travels through South America with his wife Rachel. I learned some things I didn't know about the area and as usual, laughed a lot. Mildly enjoyable to read if you like hearing about bus journeys. Not as good as I was hoping and the author relies far too much on very basic 'humour'. It's short though so didn't feel like I wasted too much time. It is a fun filled story, that shows that not everything positive happens in travel and can become unpredictable. And how those become the greatest memories that we keep. George Mahood is an award-winning writer. Specifically, he was placed third in the Little Brington Village Fete's limerick competition (Under 10s category) in 1988. It was the same year that Mrs Marriott's legendary fruit loaf was beaten in the WI cake contest for the first time in six years. George studied Communication Studies and English Literature at Leeds University. After spending a year travelling in the USA (with clothes and money), he worked for several years in a variety of jobs including charity fund-raising and garlic bread making. He currently works as a photographer, specialising in weddings. George has been the lead singer and guitarist of a rubbish band and the chairman and midfielder of an awful Sunday-league football team. George has plenty more madcap ideas that will form the basis of future books. Follow him on Twitter and Facebook to keep in touch, see more photos from FREE COUNTRY, and to hear about future projects.